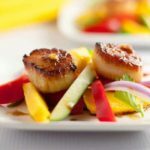 Discover three simple steps to create perfectly seared scallops, and serve them on a colourful salad made with thinly sliced mango, red pepper, cucumber and red onion. 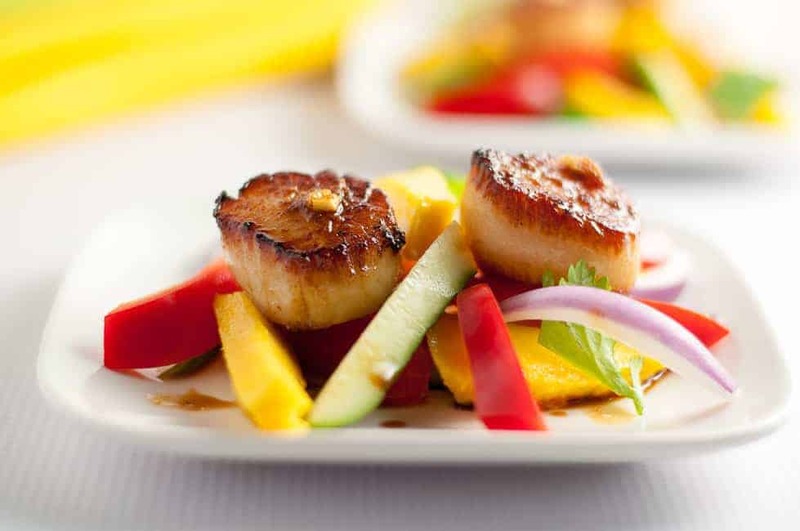 A simple mango salad topped with two perfectly seasoned and seared scallops made an ideal appetizer for two tonight. When mangos are in season, I love to add them to salads, like this Strawberry-Mango Arugula Salad. 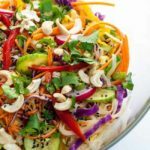 I’m inspired to use them in different dishes, like this Mango Chicken, or Slow Cooker Thai Mango Chicken, or these Thai Chicken Lettuce Wraps. Today I just wanted to add some colour to my meal so I paired them with bright red peppers, fresh cucumbers and a few slivers of red onion to make this cheerful salad. It made a perfect base for some tasty seared scallops. I’ve avoided cooking scallops at times. I’m so concerned that I’m either going to overcook them or undercook them. They’re expensive, and I don’t want to waste them! But I’ve experimented with them lately, and they’re really very simple to cook. 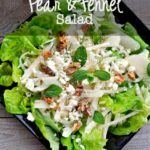 In this recipe, I prepared the salad and arranged it on the serving plates. Once I had that done, I turned my attention to the scallops. The trick is to pat the scallops very dry (so they don’t sizzle and stick to the pan), sear them in hot oil, leave them alone, but watch them carefully. Cook for three minutes on the first side until they’ve developed a nice deep golden crust, cook for no more than 2 – 3 minutes on the second side, and they’ll be done. They should be slightly translucent in the middle. If you overcook them, they’ll be tough and chewy and you’ll be turned off scallops for a long time. 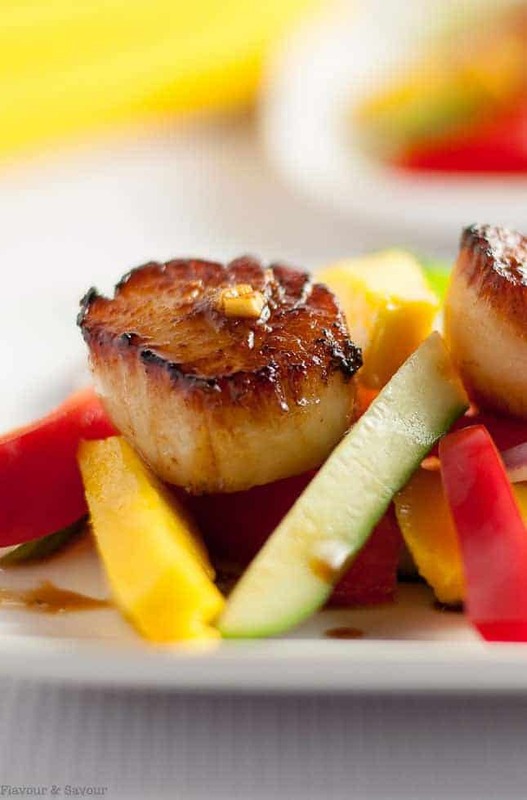 Here are three simple steps to create perfectly seared scallops, and serve them on a colourful salad made with thinly sliced mango, red pepper, cucumber and red onion. 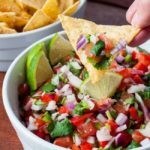 In a small bowl, mix all sauce ingredients. 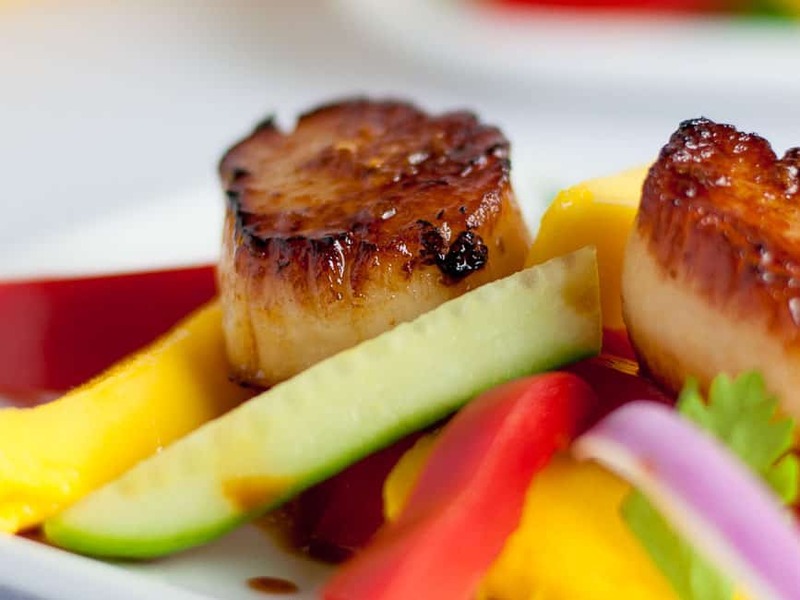 Reserve half for the salad, pour remainder over the scallops in a glass dish and marinate for no longer than 15- 20 minutes. Slice salad ingredients and arrange on serving plates. Remove the scallops from the marinade and pat dry with paper towels. Heat a 10-inch non-stick skillet over medium-high heat. Add the oil and heat just until it begins to ripple. Pat the scallops dry once more and carefully add to the pan in a single layer. Sear on one side for 3 minutes. 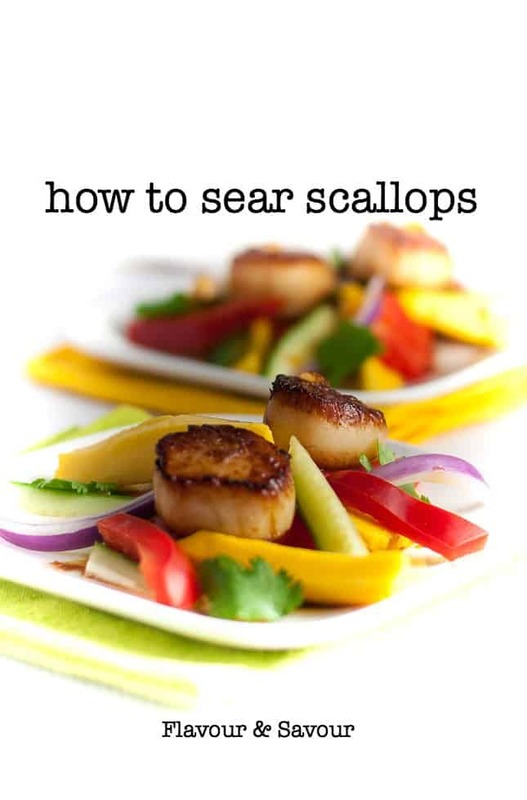 Carefully lift one to see if the underside is brown and crisp, then using tongs, turn and sear on the second side, just until it is well browned and the scallops are firm, no more than 2 - 3 minutes. The centre of the scallop should be slightly translucent. 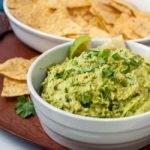 Place on top of salad, drizzle with remaining marinade and serve immediately. There is a restaurant in Bethany Beach DE that serves mango scallop salad and it’s amazing! I love this version here, definitely trying soon!